The PURESTREAM Filter-Regulator-Lubricator air preparation products are available in a variety of configurations designed to meet the requirements of every customer. PURESTREAM FRL products are constructed in metal and polybowl material and are available from 1/8” npt to 1” npt connection sizes. The Filter/Regulator/Lubricator Combo products are available in the polybowl version with standard metal guard and also in a higher pressure version with the metal bowls. Each filter/regulator/lubricator combo includes a press type manual drain. The standard filter grade available from stock is 5 micron sintered bronze. 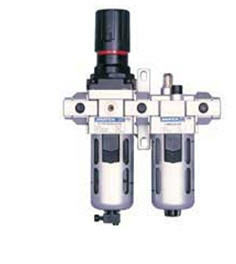 The Filter/Regulator/Lubricator Combo products are available in 7 to 140 psig. Each regulator includes a non-raising press to lock adjustment knob for locking at any set pressure. The unit is supplied with a pressure guage as standard with a 0 - 160 psig pressure range. The Lubricator includes a fog mist type regulator. Each unit is also suitable for panel mounting.